152 mm/57 MK-5-bis4 х 3 pcs. 100 mm/70 SM-5-1s6 х 2 pcs. 37 mm 61 shì16 х 2 pcs. Irian — Pan-Asian promo premium Tier VIII cruiser. This Project 68-bis light cruiser, built for the Soviet Navy, had good AA defenses and carried twelve 152 mm guns with a very long range of fire. In 1963, the ship joined the Indonesian Navy. Irian was first released for sale worldwide with the release of Update 0.8.0 on 30 January 2019. Tier VIII Premium cruiser Irian is remarkably similar to her sister ship, Mikhail Kutuzov. A few key differences between the two exist, though. Irian is Pan-Asian for starters, and gains a better torpedo suite, along with the Torpedo Reload Booster ( ) consumable in exchange for losing Mikhail Kutuzov’s Smoke Generator ( ), Defensive AA Fire ( ), and some of her range. Irian owes the largest part of her offensive strength to the twelve 152mm guns she's packing. They have the classic Russian fast shell velocities and low firing arcs, making hitting targets even at the extreme limits of her 17.5 km range much easier than other, similarly armed ships. Unfortunately, the relatively low caliber of these shells necessitates using the commander skill Inertia Fuse for HE Shells to maximize her offense. It gives Irian the punch needed to do direct damage to many of the ships within her tier spread, a cost well worth the loss of fire chance. Be wary though: as with most other cruisers, Irian requires time to do damage with her guns, and is very vulnerable to return fire. Every moment spent spotted and shooting is time that the enemy team can fire back at her. Irian must be played with care, using her range and excellent shell ballistics to keep enemies at arm's length. However, should captains find themselves a touch closer to their foes, Irian possesses a potent deepwater torpedo armament. While they lose the ability to harm destroyers, these torpedoes are perfect for quickly taking down any other class of ship. 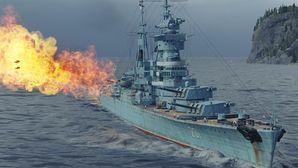 They are the longest ranged torpedoes put on to an cruiser in World of Warships with a maximum range of 13.5 km, and are extremely stealthy while packing a sizeable punch. While it certainly isn't risk-free getting into the ranges required to use these torpedoes due to Irians’ relative fragility, they are a welcome addition to her arsenal... especially with the inclusion of her Torpedo Reload Booster ( ) consumable, that allows captains to launch a second salvo of torpedoes very quickly. Overall, Irian has an very high ceiling in terms of offensive firepower in exchange for not being overly stealthy or well-armored. She is very much a glass cannon, but one that will make her impact felt in any battle, whether she ultimately sinks or not. Twelve long range, high velocity 152mm guns. One quintuple-tube torpedo launchers on each side with, long range, and stealthy torpedoes. Equips the Torpedo Reload Booster ( ) consumable for quickly reloading her torpedoes. Good base 12% fire chance on HE shells. Requires IFHE to deal direct damage to 32mm plating. Lacks the vision-obscuring smoke of sister ship Mikhail Kutuzov and her smoke. Very lightly armored; capable of taking damage from nearly any angle. Ballistic performance of her guns makes utilizing islands as cover difficult. Rudder shift time is very sub-par for her tier; as a result, she handles somewhat sluggishly. As a premium ship, Irian doesn't have any upgrades to research. Key skills for Irian commanders include Priority Target, Adrenaline Rush, Demolition Expert, and Inertia Fuse for HE Shells. Captains are encouraged to equip Premium variants of the consumables to further improve Irian’s performance in battle. As a premium ship, Irian comes included with Type 10 camouflage that lowers her detection radius, reduces the accuracy of incoming shells, reduces her repair costs, and increases the amount of experience she earns. The Sverdlov-class light cruisers were a development over the Chapayev-class, which was still a design from the World War II era. While the armor and main armament of the ships were to remain the same, other improvements were desired. Compared to the Chapayevs, the Sverdlov class was noticeably enlarged. With an overall length of 212 meters, a 22 meter beam, and a draft of almost 7.4 meters, these ships could displace up to 16,600 tons when fully loaded. The crew complement counted 1,270 men. As light cruisers, the main armament was fairly standard for ships of their time: four turrets, with each housing three 152mm L/57 B-38 guns, were mounted on the centerline. Firing a 55kg heavy shell at ranges of up to thirty kilometers, these guns could fire six-and-a-half rounds every minute. Auxilliary armament saw twelve twin-mounted 100mm/70 dual purpose guns, with three mounts on each side of the ship. Each gun could fire a 15.6kg heavy shell with up to 18 rounds per minute. The automatic AA guns consisted of 16 twin mounts with fully automatic 37mm/70 guns. Two quintuple Torpedo launchers and up to 132 mines were also installed. The armor protection was identical to that of the preceding Chapayev class. The vital areas were protected by a 100mm strong belt, which was closed by a 100mm strong bulkhead to the rear and 120mm to the front. A 50mm thick deck provided protection against plunging shells and bombs. The main armament was protected by 130mm strong barbettes, while the turrets featured a 175mm face plate and 60-75mm thick sides and roof. For the conning tower, 130mm armor for the sides and a 100mm roof were deemed sufficient. Six boilers produced steam for two turbines, which could generate 110,000 shaft horsepower on two shafts. This allowed for a designed top speed of 32.7 knots, and with enough fuel — greatly improved over the Chapayev class — for a cruising range up to 5,700 nautical miles at 17 knots. Irian's sister ship, Sverdlov at the 1953 Coronation Naval Review. One of the 152mm/57 B-38 MK-5bis guns used for the Sverdlov-class cruisers. The rear 152mm turrets from Mikhail Kutuzov. This page was last modified on 27 February 2019, at 21:51. This page has been accessed 17,627 times.